Essential is a modern minimalist theme in the WordPress market and it is perfect for any website designer who has a love for something that is simple and sophisticated. Let us explore more about this theme and the features it is embedded with. What is the Essential Theme? 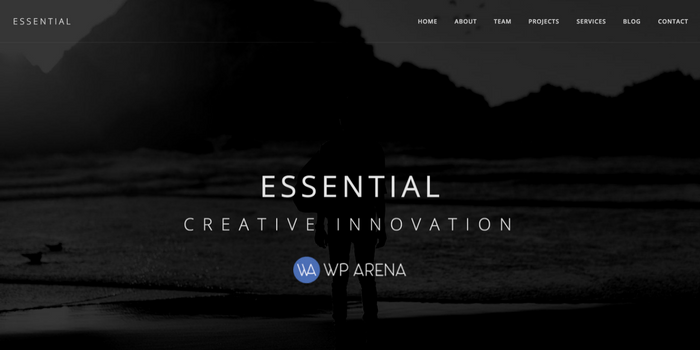 Essential is a WordPress theme which works as a single website’s template, making it a unique way to present content to website visitors. Website designers can enjoy the exclusive design and layout of Essential and its flexibility. This theme has been created in such a way as to accommodate companies and brands of all shapes and sizes, so it can be used for any website. Do not let the sleekness fool you, this theme can be molded in any way to suit the website designer’s needs and it can be customized in all kinds of ways. Essential works like all other themes and while it may seem a bit too simplistic for some website designers, it is still a very unique, clean and elegant way to present content on a website. It provides a good base for designers to build upon and this means that designers can easily get creative with this theme and use its sleek template for effective material display. These features are what make Essential completely worthwhile and it provides value for the money a website designer would have to pay because it is providing the designer a professional design on which they can suitably present their material. Anything from photography portfolios to blogging content can be displayed using this theme. Essential also provides website visitors with a smooth experience as it is responsive on all kinds of devices and is highly responsive. The Essential theme only costs $49 (with additional costs for things that the website developer or designer would like to add. This price is very affordable for a WordPress theme and it is also market competitive as the average rate for a WordPress theme is slightly more than this. For $49, this theme provides much more value than expected. Why Should You Buy the Essential Theme? This theme is a very modern approach to website design and it provides a creative and innovative way in which website content can be presented to visitors. The stylish design and layout has a professional touch that will exude a sense of elegance to website visitors. Also, Essential’s price is very affordable in comparison to other WordPress themes and this means that anyone who is looking for something budget-friendly can get a feature-packed theme that will cater to all of their needs. Although Essential is quite simplistic, this can be seen as a beneficial aspect because it can be used by beginners and experts alike. It is a diverse theme that was created with an ease of use in mind while also attempting to ensure that all kinds of companies, brands, and content can be presented effectively through this theme. Also, the fact that Essential is highly customizable means that website designers can set it up according to their preferences. The amount of documentation and support available on this modern theme will allow for anyone to make effective use of the theme while utilizing all of the features available at their disposal. While some may be fooled by how simplistic this theme is, the beauty actually lies in its simplicity. It can be used by experts and beginners alike and provides website designers with the chance to make their websites appear professional. Website designers can create something they can be proud of with the use of Essential. However, before actually buying and installing this theme, it is important to have a look at the tutorials and documentation available on it as a way to determine whether or not the theme is fitting in with the designer’s vision. Conclusively, Essential is a theme that can provide any website designer with an experience they will never forget. Thus, do not overlook this dark horse of WordPress themes before actually looking at its value and worth.